There are three periods in this era. The Triassic - started 251 million years ago. The period just after the largest known mass extinction event but more famous for the first appearance of the dinosaurs. The Jurassic - started 199 million years ago. The period in which the dinosaurs became the rulers of the Earth ... and famous for a movie by that name containing mostly dinosaurs from the next period! The Cretaceous - started 145 million years ago. This period contains some of the best known dinosaurs of all time and is famous for ending in a mass extinction which eliminated all dinosaurs. The Triassic period is a renewal. At least 90% of all life has become extinct. New species are developing in the early Triassic. One of the new species was Lystrosaurus, a reptile about the size of a pig. Another new reptile was Euparkeria. 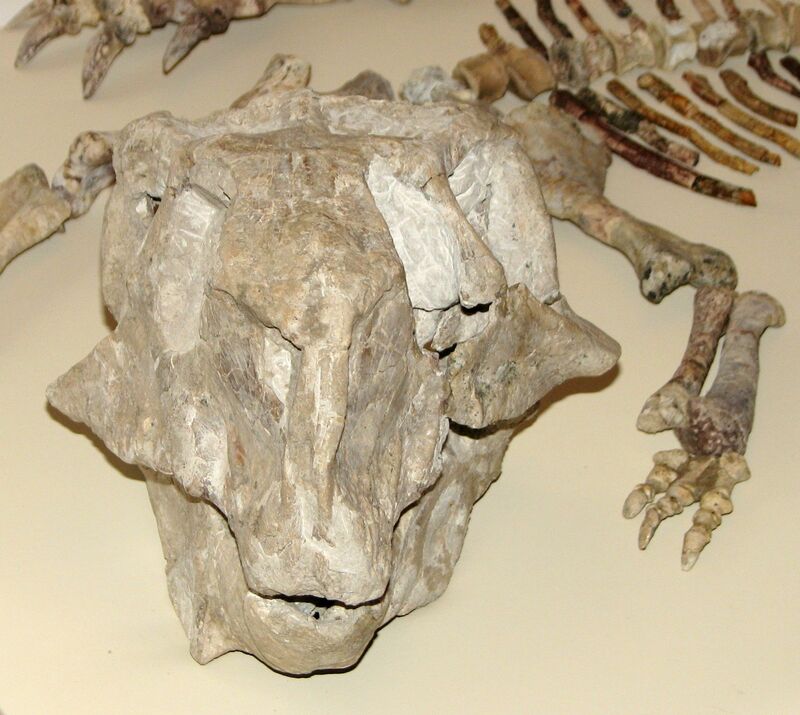 Above is a reproduction of a Euparkeria skull. 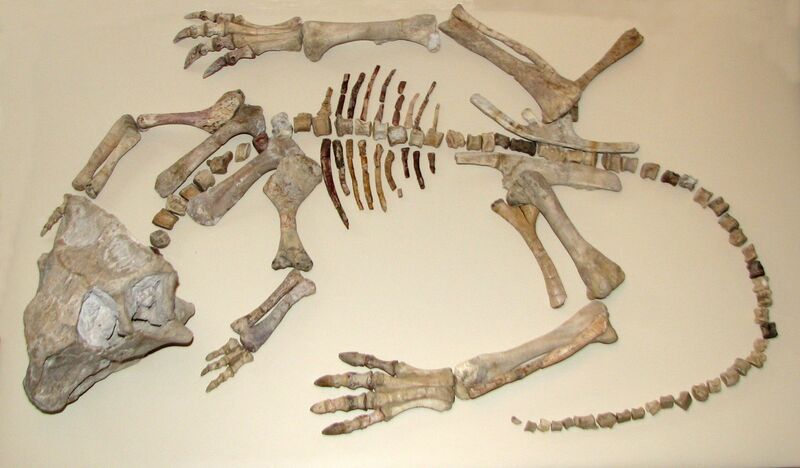 Euparkeria is thought to be the ancestor of the dinosaurs. This reptile appeared early in the Triassic, was about 22 inches long and had the long back legs that would be seen in the dinosaurs. The long back legs helped them to move fast and, in some cases, stand upright. It would be about another 10 million years before our first known dinosaurs appear. The earliest know dinosaur at this time is Eoraptor. Eoraptor ("dawn thief") appeared about 228 million years ago. He was about 3 feet long and 1 foot high, hollow-boned, sharp serrated teeth, and sharp claws. Above is a reproduction of an Eoraptor skull. Eoraptor had 5 fingers on each hand (front foot) and three toes on each hind foot. 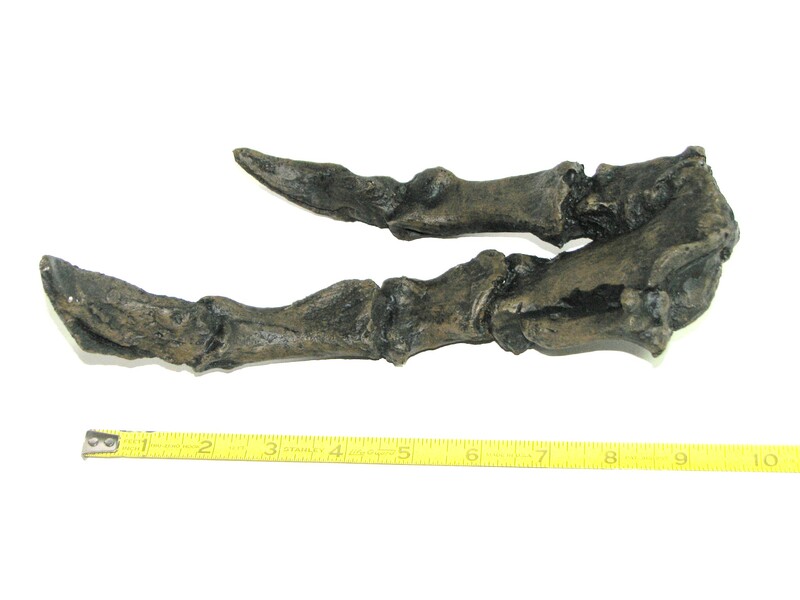 The 3 toes on each foot were typical of a raptor in the dinosaurs. Staurikosaurus was another of the earliest dinosaurs. Staurikosaurus was about 6 feet long. 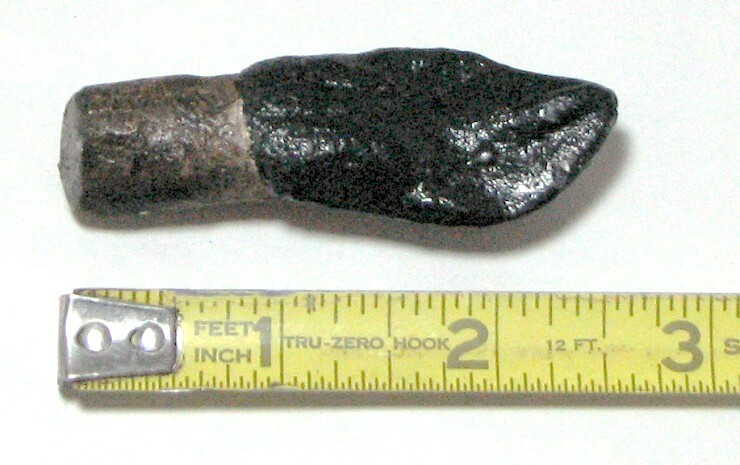 The Staurikosaurus tooth (above) had a serrated edge also. So far the dinosaurs and dinosaur ancestor are all from South America. But, remember, at this time the land mass was Pangaea - one body of land that would, by the end of the Cretaceous, split up to look closer to what we now see as our continents. Coelophysis, from 220 million years ago is probably the best known Triassic dinosaur. Coelophysis was about 10 feet long and hollow-boned. 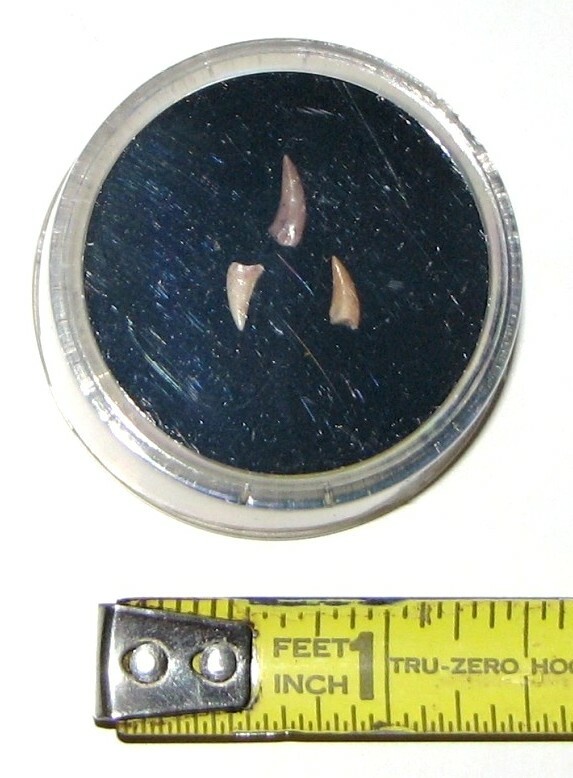 He had small recursive serrated teeth (below). Recursive teeth curve backward into the animal's mouth making it harder for anything it caught to escape. Coelophysis is best known from the Ghost Ranch in New Mexico. At the Ghost Ranch an entire graveyard of Coelophysis skeletons was found. It appears an entire group (flock?) of Coelophysis were drowned in a flash flood. In one of the skeletons, the stomach area, they found a young Coelophysis. This has lead to the Coelophysis being labeled a cannibal. A scientist from the American Museum of Natural History supposedly has rethought this and come up with the belief that the young Coelophysis only appears to have been eaten by an adult. He believes that with all the remains lying on top each other the young is actually lying under an adult and not in the adult. 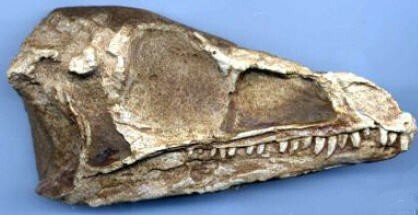 Above is a reproduction of a Coelophysis head. The Triassic ended with a mass extinction ... or did it? There was a decrease in water and land species but it wasn't nearly as dramatic as the Permian extinction or the K-T extinction. Some scientists even debate whether it should be called an extinction event. During this next period the dinosaurs grew and developed. In this period we have the giants and the first birds. This is also the period where flowering plants first appeared. Some of the standard life of this time and every time almost since the first life appeared on the land was insects. 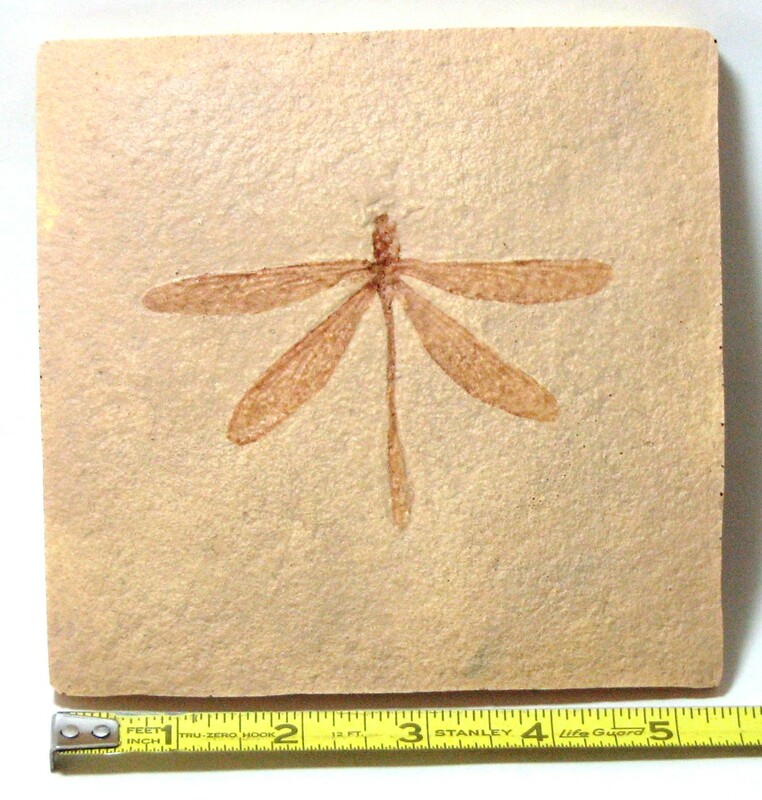 Dragonflies had existed since the Paleozoic Era (reproduction : Jurassic Dragonfly). Above left is a Jurassic beetle fossilized in a very fine limestone. On the right is an unknown Chinese Jurassic insect. 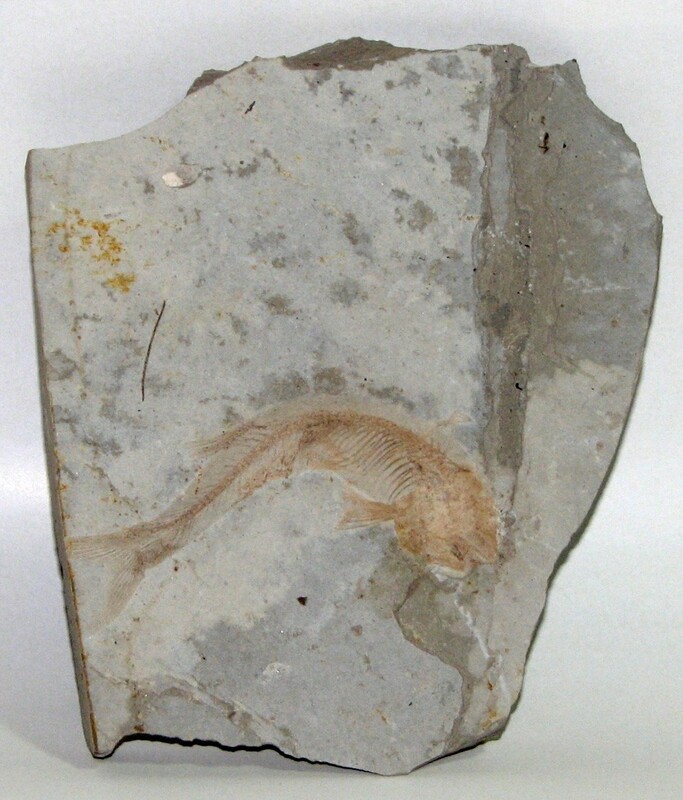 Below is Lycoptera, a Chinese fish of the Jurassic. This fish is only about 3 inches long. 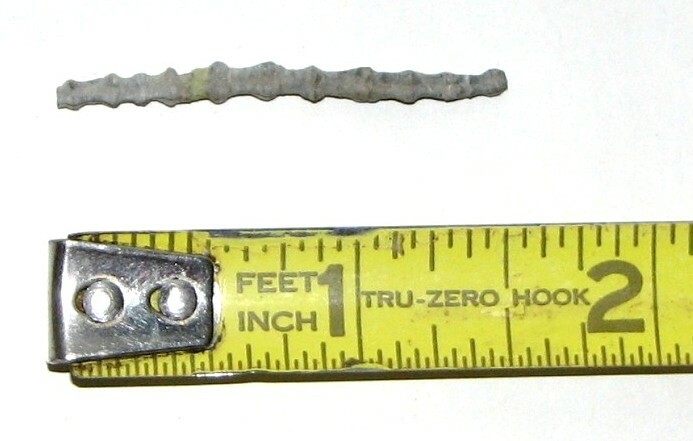 Above, on the left, is a fossilized Jurassic worm. On the right are fossilized raindrops. There must have been a light rain followed by the sun baking the wet soil. When more soil landed on top the now dry, baked, pock-marked surface, the raindrop pattern was sealed in. This was also the time of the flying reptiles. These are not dinosaurs. Dinosaurs did not fly and did not live in the water. 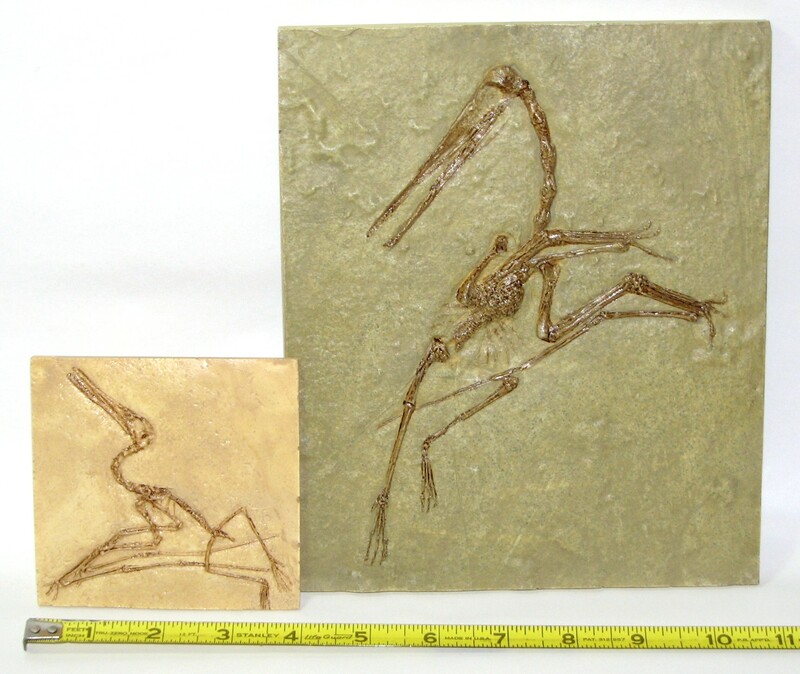 Flying reptiles, also called pterosaurs, may have first appeared back in the Triassic. Here are some from the Jurassic. On the left is Pterodactyl Elegans, on the right is Pterodactyl Antiquus. As you can see some of the pterodactyls were relatively small. This is Rhamphorhynchus, one of the more famous flying reptiles. Rhamphorhynchus is most notable for the protruding teeth and the diamond shaped tail. 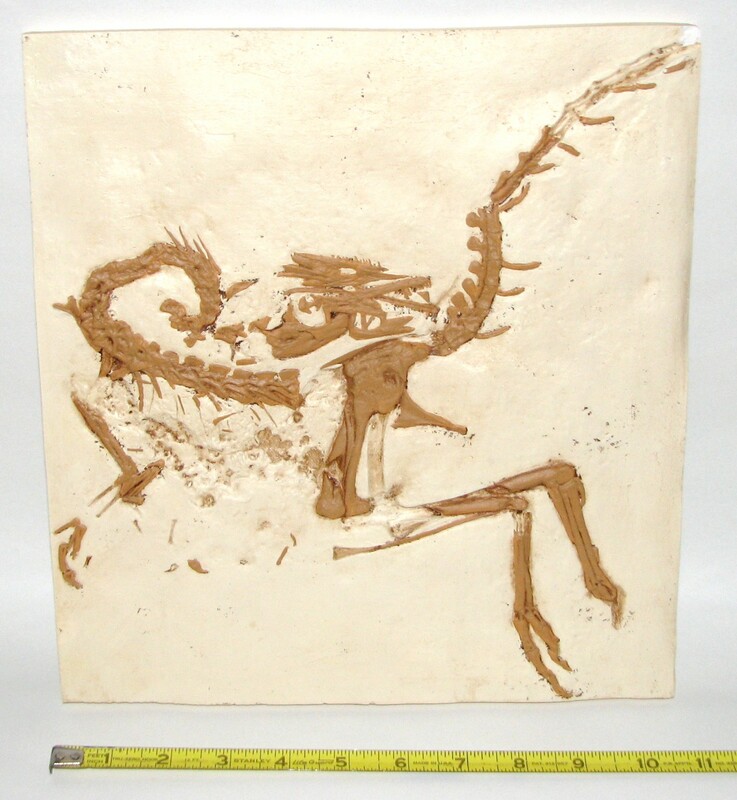 Another famous fossil from this time is Archaeopteryx lithographica - the first known bird. 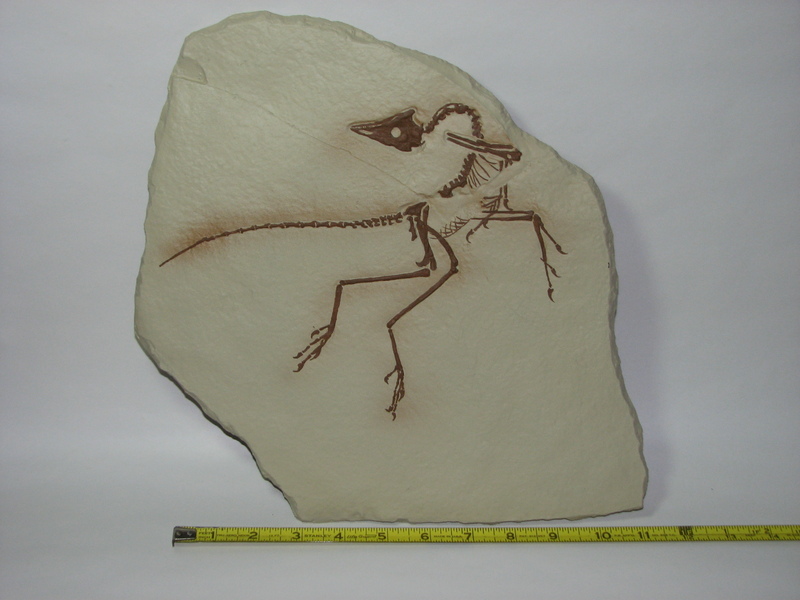 This is a reproduction of the first specimen. At the time it was found in the limestone in Germany scientists were trying to determine what kind of dinosaur it was. Notice that on this one you can see the impression of the feathers. These are actual feathers like birds have now, not proto-feathers as are found on some dinosaurs. Archaeopteryx = "ancient wing". 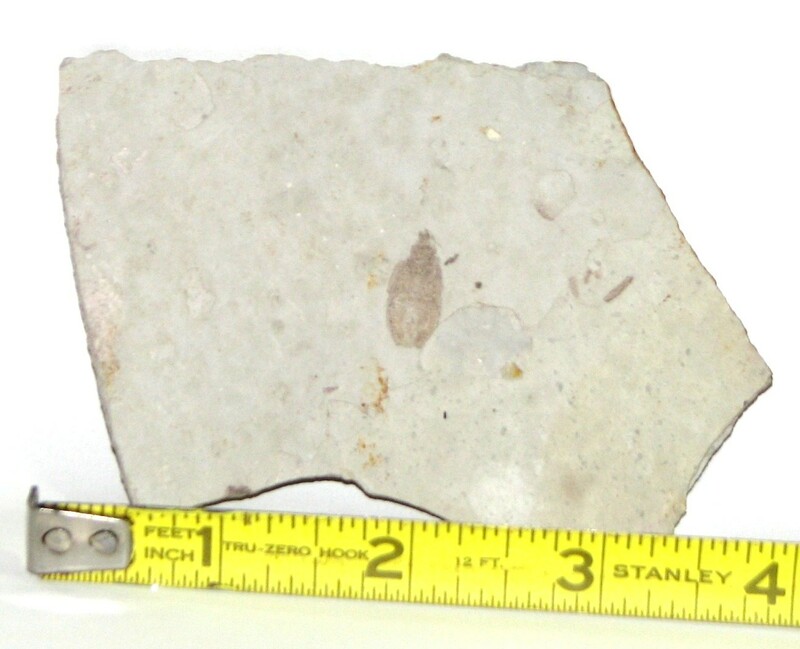 The "lithographica" comes from the limestone that is so fine-grained that it can leave an impression that is almost as detailed as a lithograph. The material surrounding the beetle above that allowed such fine detail is the same material. One of the dinosaurs from this period is the Grallator - a dinosaur only known by its footprint. 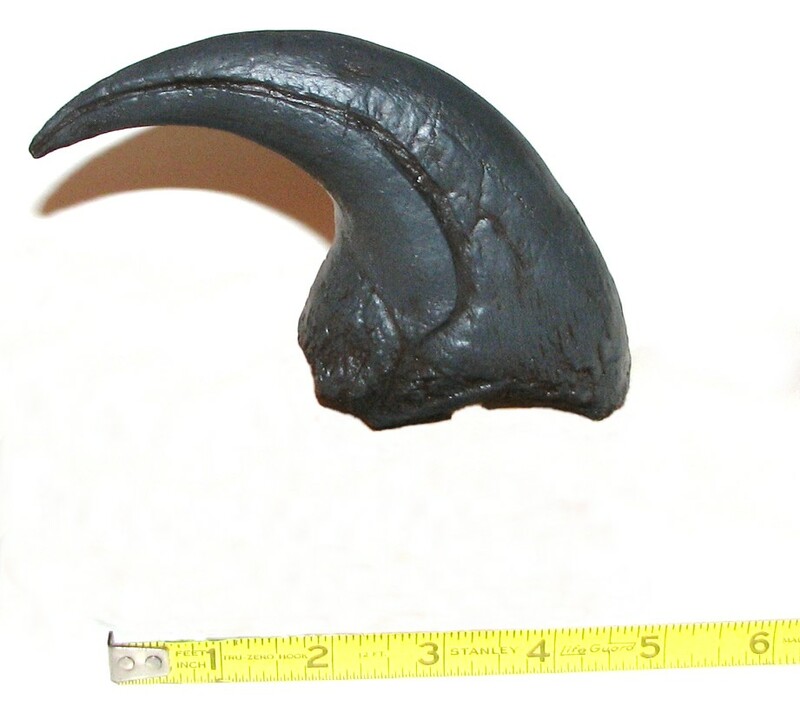 The Grallator is probably a therapod since it is 3-toed but the footprint has never been linked to a known dinosaur. 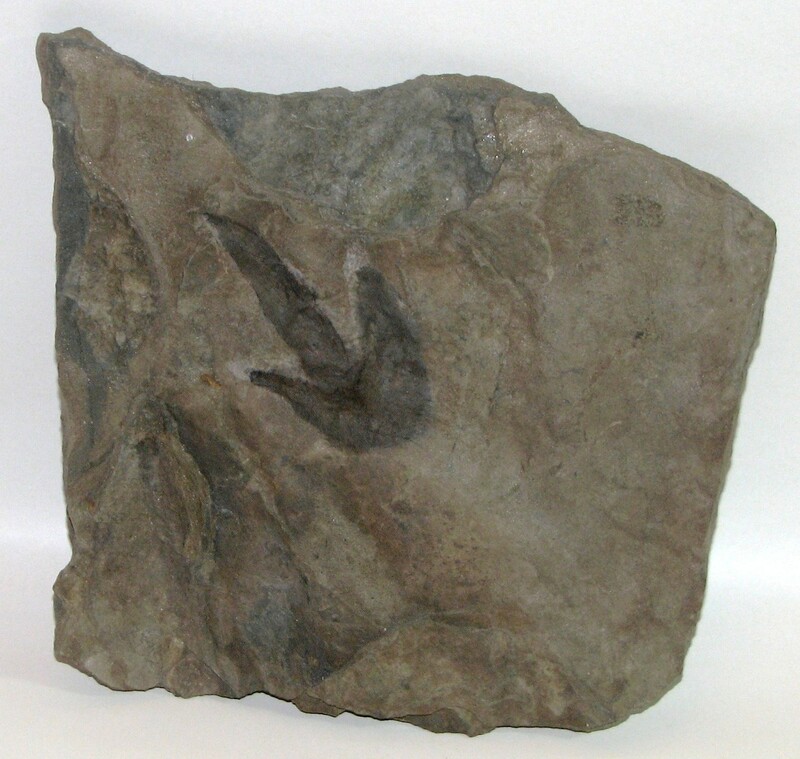 The footprint is very similar to that of the Triassic Coelophysis. One of the more famous large dinosaurs from this period is the Brontosaurus, now correctly called the Apatosaurus. Apatosaurus was one of the long-necked giants. A slightly smaller version of the Apatosaurus was the Camarasaurus. 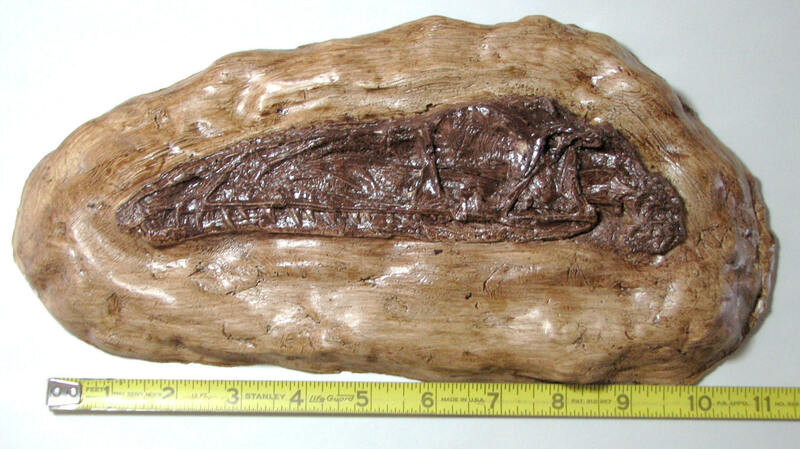 To give you an idea of size here is a section of a Camarasaurus rib. You can compare its size to one of your ribs. And this is not one of the larger ribs Camarasaurus had. The Camarasaurus tooth was known as a "leaf-shaped" tooth - below is a Camarasaurus tooth reproduction. 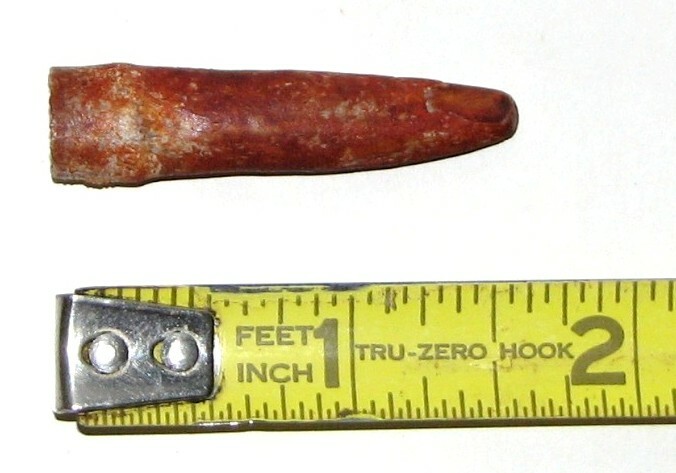 A tooth like this is referred to as pencil-like. 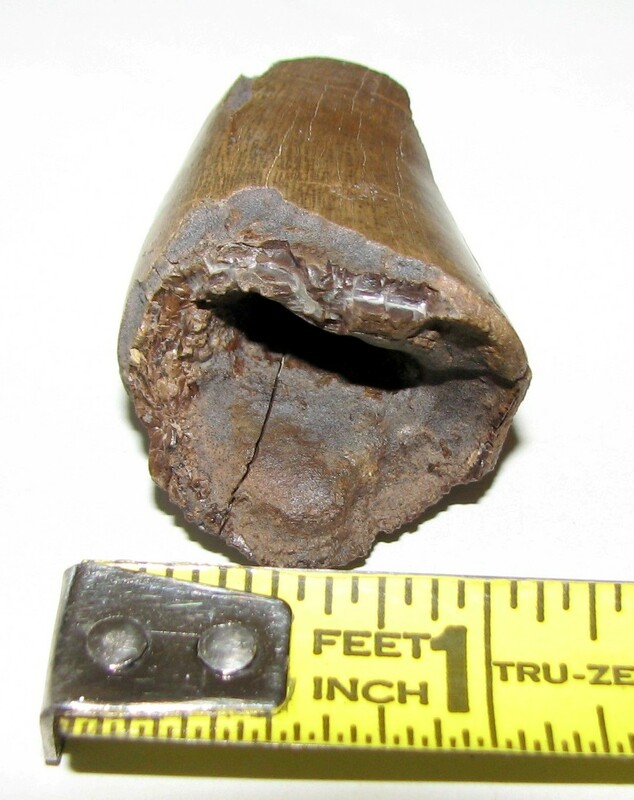 This was very similar to the Apatosaurus tooth. In both cases the sauropod probably chomped down on a branch and pulled, stripping away the leaves. The leaves were then swallowed. These dinosaurs did not have the means to chew. The way the cellulose was broken down was very similar to the way chickens eat. A chicken swallows its food and small stones. The stones are kept in the gizzard where they are churned by powerful muscles. When the grain the chicken swallows gets to the gizzard, the churning stones break it down and grind it up, similar to the process performed by our teeth. The sauropods did the same. 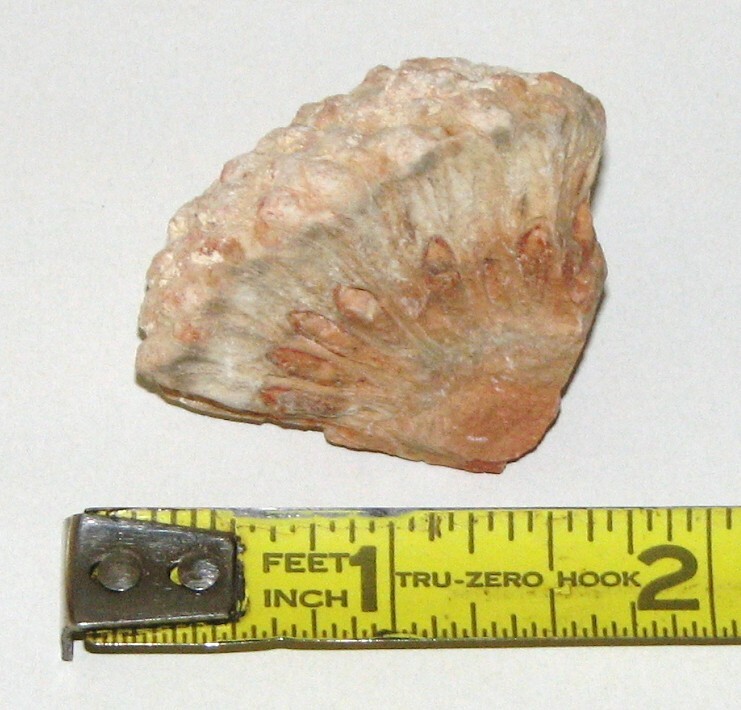 Above are actual gastroliths. The ones on the left were probably from one of the smaller herbivores; the one on the right could be from a sauropod. And with a larger food supply there arose a larger predator: the Allosaurus. Above left is an Allosaurus foot claw reproduction. 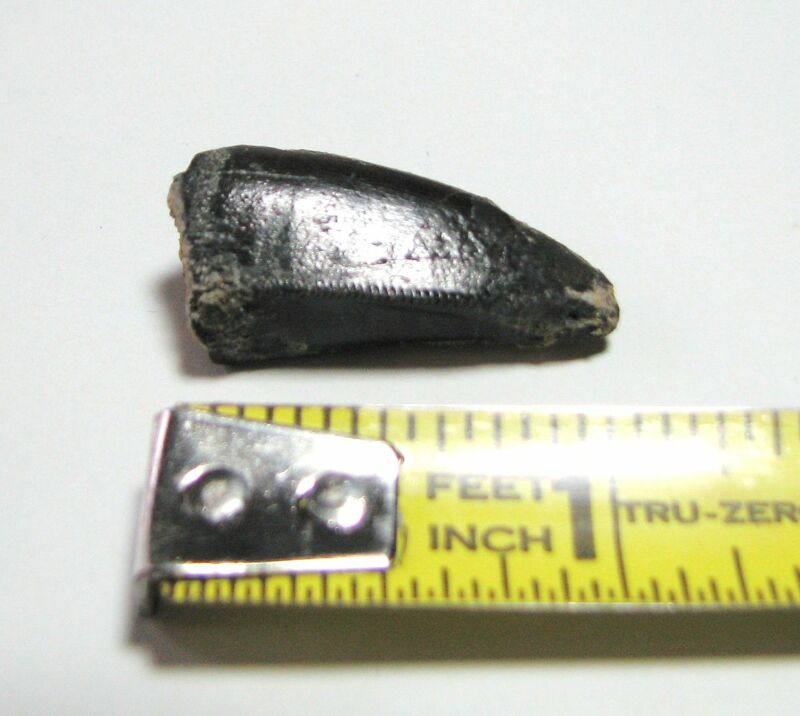 On the right is an Allosaurus tooth section. The Allosaurus was almost as large as the Tyrannosaurus Rex but with better proportions. The arms were not as short and the legs were built for more speed. The teeth were serrated and thick for strength. As in all reptiles, dinosaurs were hatched from eggs. 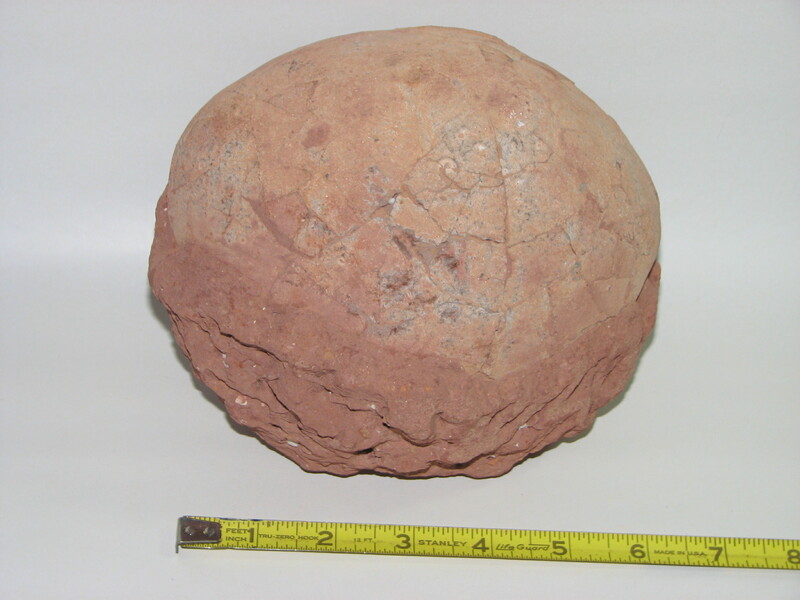 This is a Jurassic dinosaur egg. What you are seeing as the top of the egg is most probably the bottom. When the young hatch they break through the top and shatter it. When a nest of eggs is discovered, the team will dig below the nest and flip it over. The dirt is now cleaned off the top (formerly the bottom) and the egg is fit for display. The dinosaurs are known for their large size, especially from the Jurassic sauropods. But the Jurassic produced the smallest known dinosaur, the Compsognathus. This is another example of preservation in the German limestone. 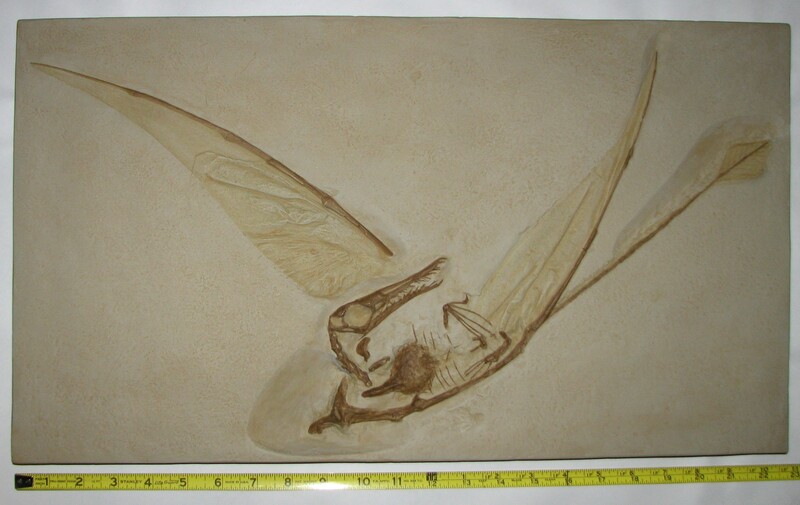 The articulation (all bones in their correct location as when the animal was alive) is not as complete as in the Archaeopteryx, but it is a well-preserved specimen. Notice the position of the neck. 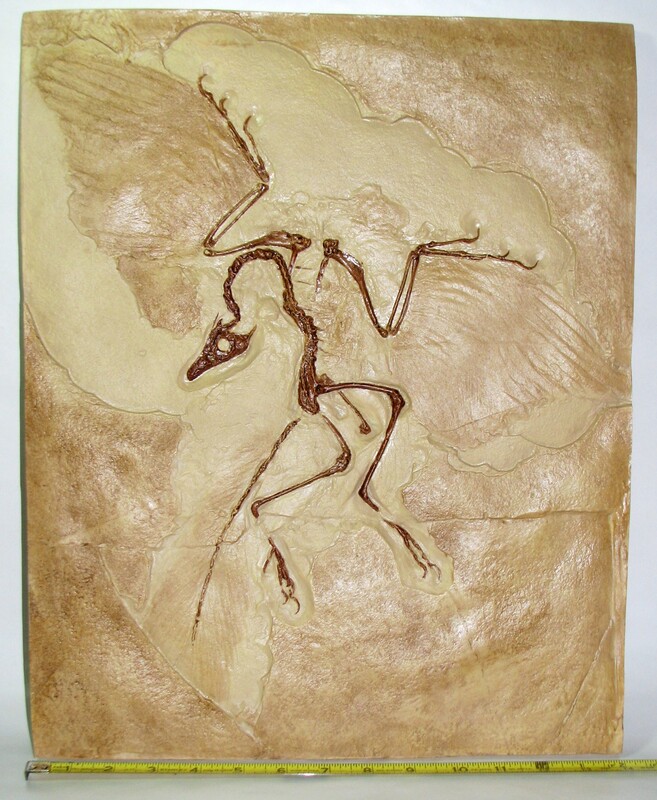 The same position of the neck is noticeable in the Archaeopteryx fossils. This is due to a contraction of tendons along the neck pulling it backward into the position you see. Another of the famous dinosaurs of this time period is the Stegosaurus. Below is a scale reproduction of a Stegosaurus head in the Denver Museum of Natural History - and, yes, the throat "skin" has been preserved. What you are seeing as throat skin is actually scutes - boney structures that would have been under the skin as a sort of armor. 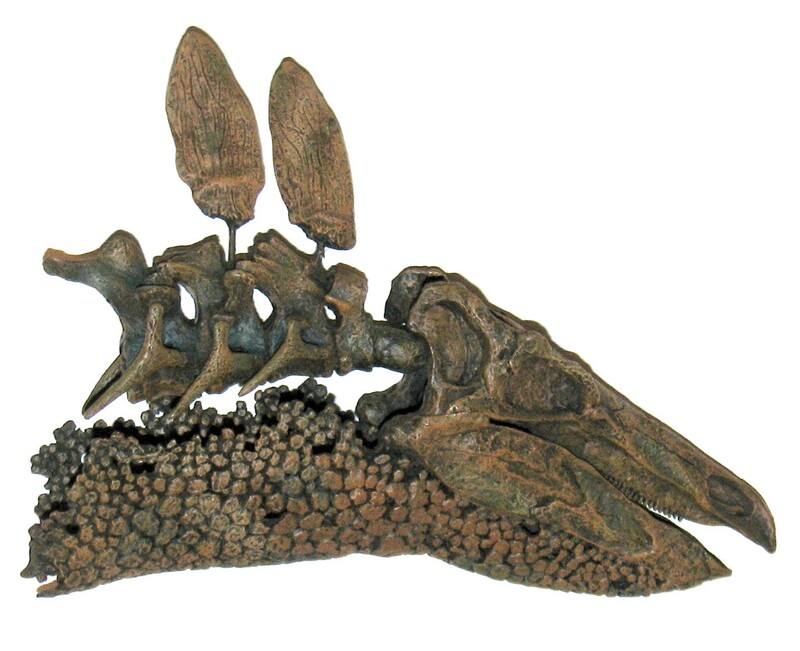 This is the dinosaur famous for the plates along his back and for the four spikes on his tail. In the above reproduction of one of the Stegosaurus plates you can see the lines that were probably the location of blood vessels. The plates with their vessels may have been used for heating and cooling the Stegosaurus - turning sideways to the sun heating the animal while turning so the sun didn't hit the side of the plate permitted heat to escape from the blood vessels. They may have also functioned as a display for courtship or warning by flushing the plates with blood to change their color and appearance. And, of course, all those large plates served as a deterrent to predators that might look at a Stegosaurus as a meal. The other defense was the 2 pair of spikes on the tail. The reproduction below gives you an idea of what they were like. This is not the largest of the spikes. These spikes could be 3 feet long. And they would be covered by a material similar to our fingernails which would make them a bit larger and much sharper. The spikes would project out to the side, 2 per side, near the end of the tail. A swipe sideways and an Allosaurus could have a major injury! And remember, the Stegosaurus controlled all this with a brain the size of a walnut. So there was probably not a lot of analysis going on. When a threatening situation appear to exist the Stegosaurus most probably did more acting to protect itself than wondering if it was a real threat or not. Some of the plants during this period would be somewhat recognizable to us. 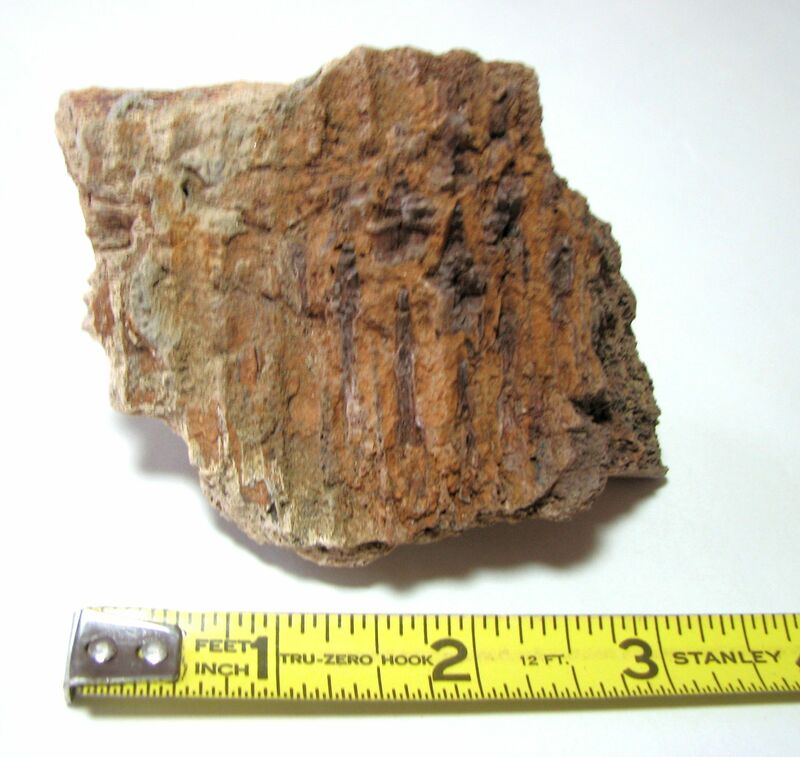 Here is a pinecone from the Jurassic - outside on the left, inside on the right. You can see the seeds in the inside view. Another plant of note is the Archaefructus - the first known flowering plant. 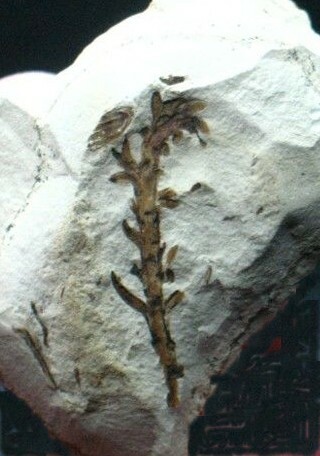 The Archaefructus was a water plant but showed the beginnings of flowers. It has carpals and stamen. The dating of this fossil is now under question. Some say this is actually a Cretaceous plant rather than a Jurassic. The Cretaceous period was the beginning of true flowering plants. Grass was still about 100 million years away. This dinosaur lived about 115 million years ago. This is Psittacosaurus. "Psittacosaurus means "parrot lizard". Looking at his head you can see he had a beak giving him a bit of a parrot appearance. Notice the projections at the cheeks. Scientists believe these, over time, grew and developed into a large frill. Psittacosaurus is a ceratopsian dinosaur and is the ancestor of the Triceratops. 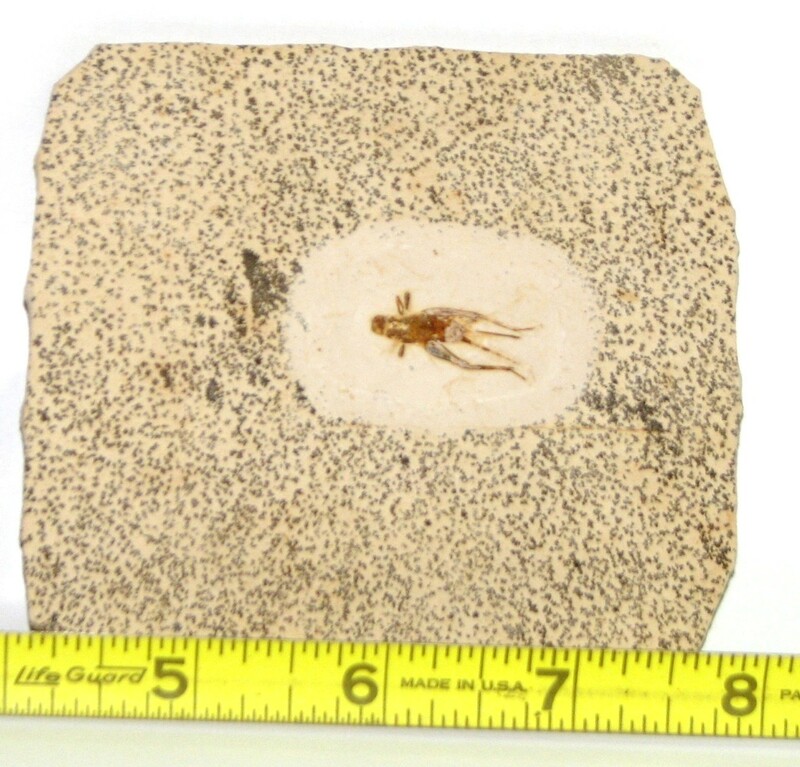 This is also another example of how well limestone can preserve the details of some fossils. In the movie Jurassic Park dinosaurs are cloned from insects found in amber. 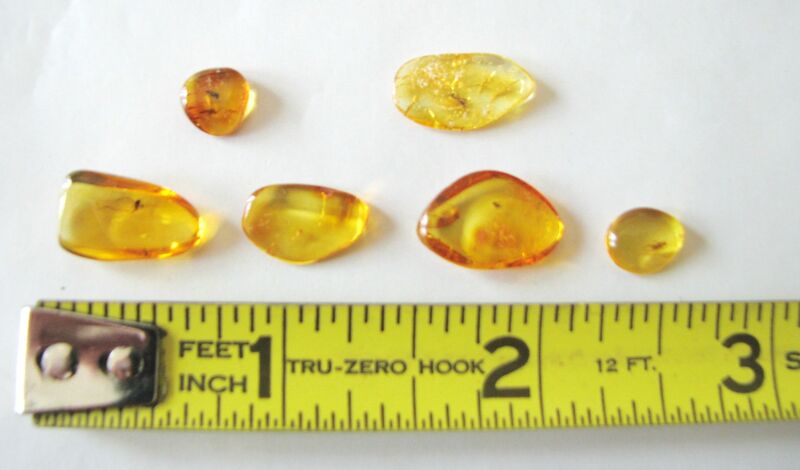 The amber being mined is from the Dominican Republic. Dominican amber is only 40 million years old and, existing 25 million years after the dinosaurs, could not produce dinosaur DNA. Below are insects in Baltic amber. 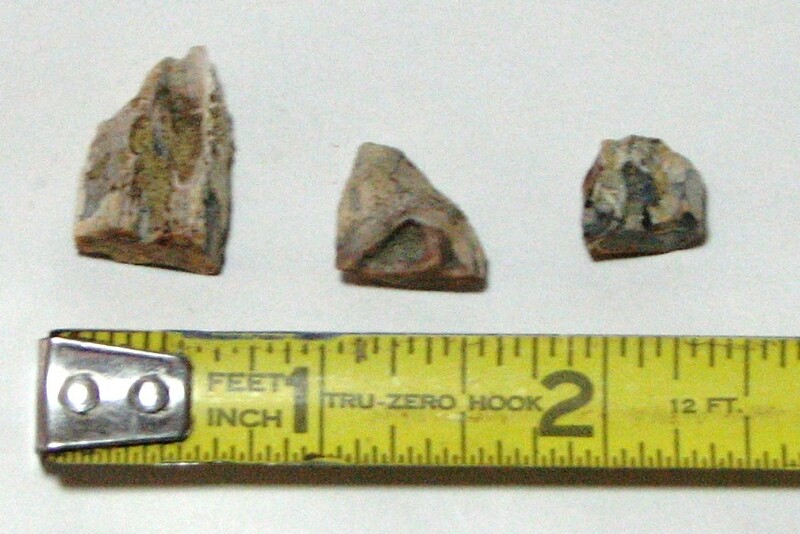 These pieces are from the Cretaceous. If you were to examine these using a macroscope you would see the insects as they appeared when alive. We have frogs and lizards preserved in amber. 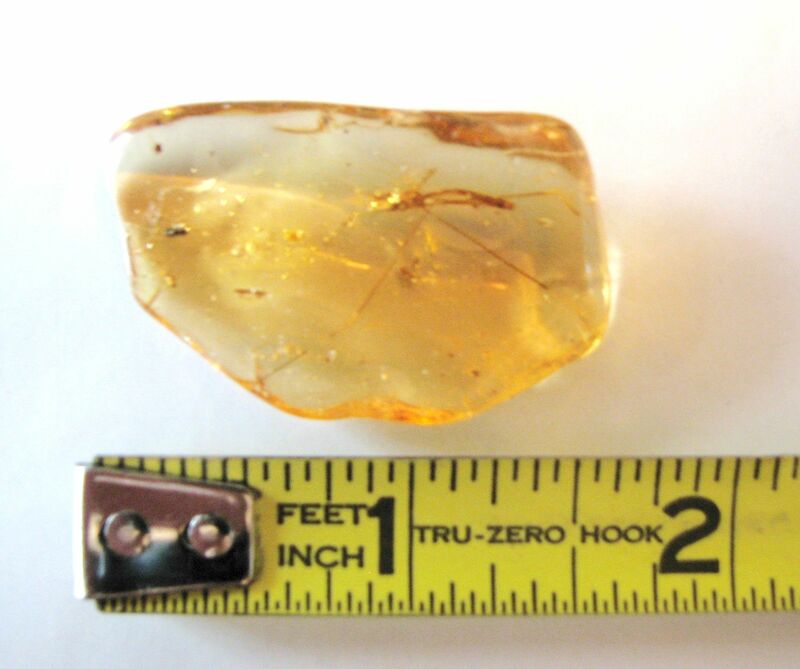 Amber is tree sap that has fallen into water and hardened. If the sap has flowed over an insect or small animal trapping it, that animal is preserved as it was when it was trapped millions of years ago. In the Cretaceous a new type of dinosaur developed - the duckbill. These hadrosaurs were herbivores that chewed their food. They had cheeks and batteries of teeth in their jaws. 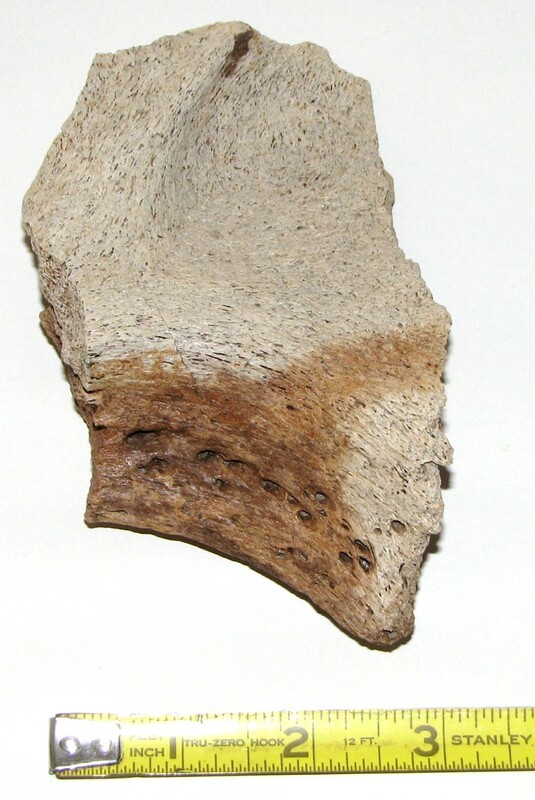 This is part of a hadrosaur jaw. The grooves were where the teeth grew upward. As teeth would be worn or lost, there were always more teeth behind to grow and replace them. You can also see that this was not just teeth as we know them but a jaw full of small size teeth that could mash the vegetation. These were very large animals. 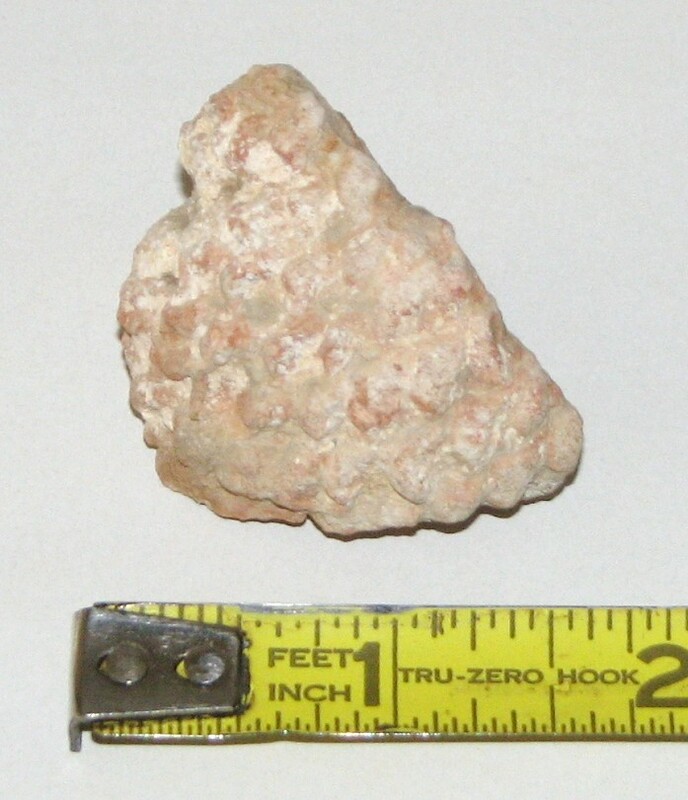 Below is a metatarsal (toe) from a Maiasaura. Maiasaura was a duckbill that was discovered by Jack Horner. In fact he discovered a Maiasaura nesting ground. One of the more interesting, and relatively unknown, dinosaurs from this period is the Paranychodon. The teeth are particularly unusual. Notice the grooves in the close-up on the right. These grooves are similar to the blood grooves in bayonets. The grooves in the bayonet allow the soldier to stab and remove the bayonet from its victim. 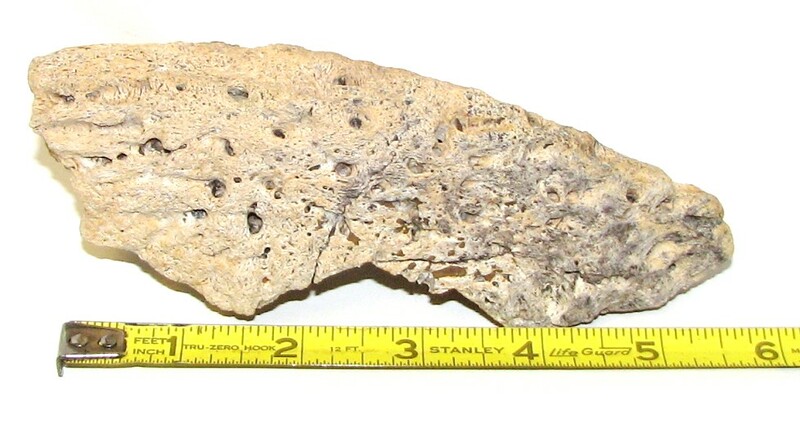 Above is a Paranychodon vertebra. It wasn't a large dinosaur. This is about all that is know about the Paranychodon. The Cretaceous produced one of the most famous plant-eating dinosaurs - the Triceratops. The mounted Triceratops skeleton has to be seen to appreciate the size of this dinosaur. The head alone is 6 feet long. The Triceratops could grow to 8 feet tall. 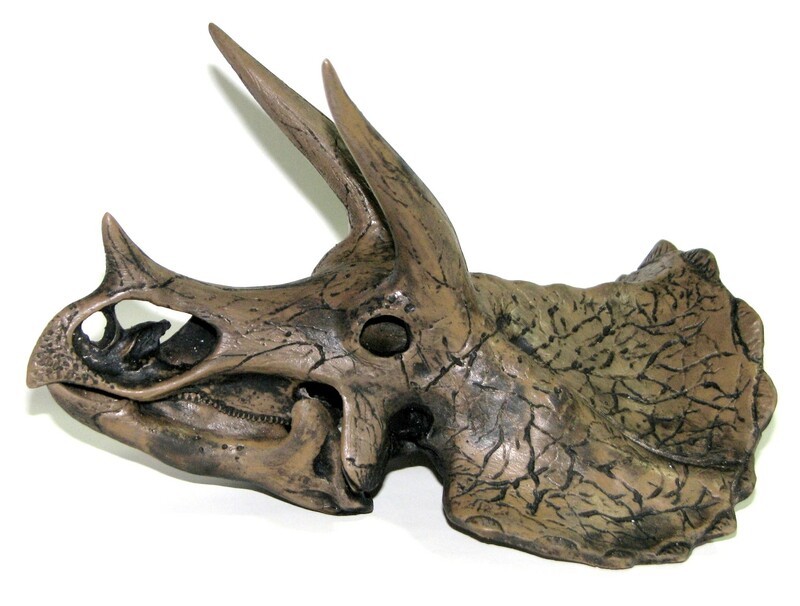 Below is a Triceratops occipital condyle. 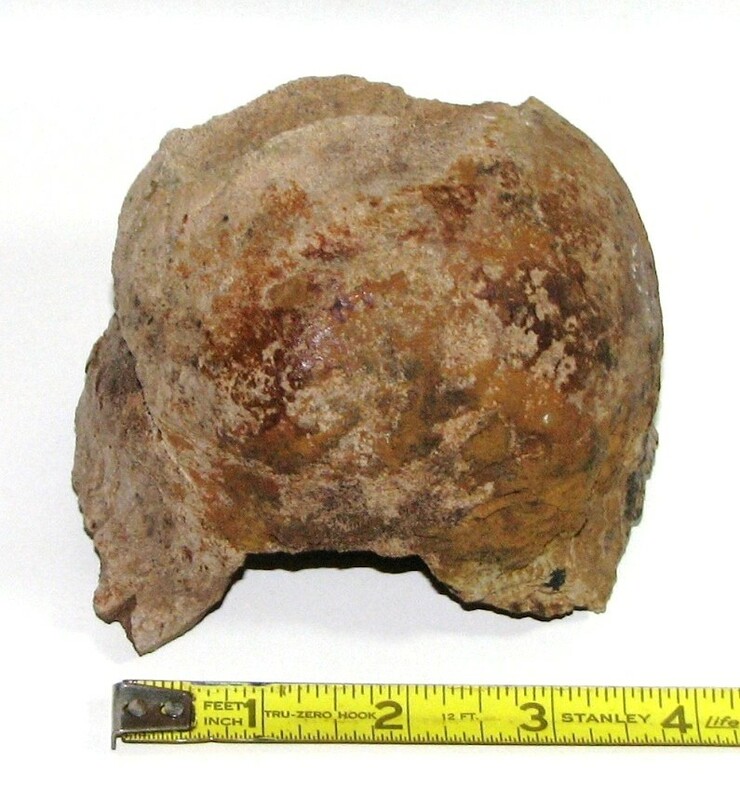 This is a ball-shaped piece on the back of the skull that was attached to the spine and allowed the Triceratops to pivot its head. Above, on the right, you can see the "bump" in the center of the bottom of the Triceratops skull. Just above that is a hole where the spinal column would enter the skull and connect to the brain. 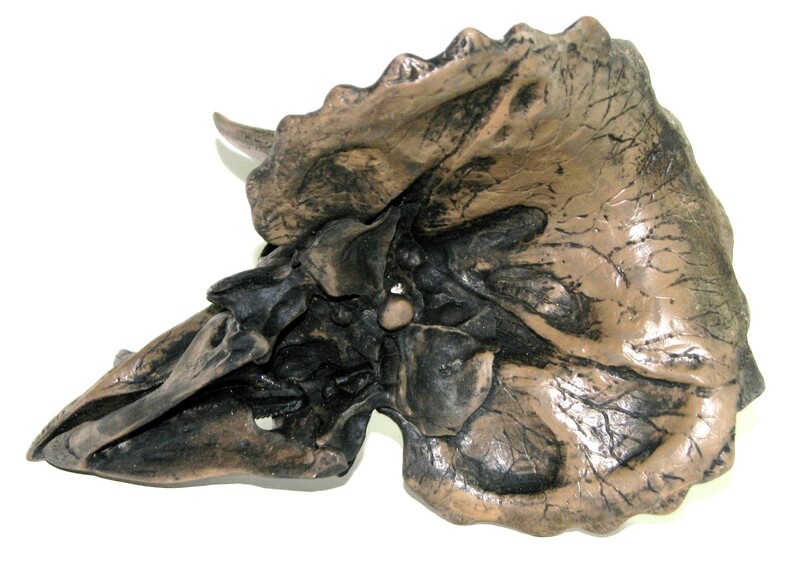 To give you an idea of size, below is a section of a Triceratops skull around the eye socket. The outside view is on the left, the larger inside opening is shown on the right. 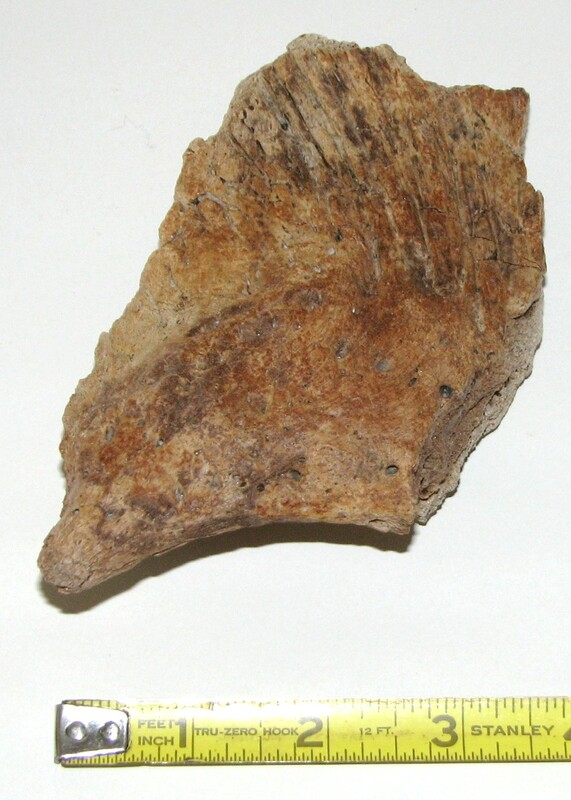 Above is a section of a Triceratops rostrum. This was the section at the end of his upper beak that could be used to snip off food. The lower end, the cutting end, is to the right. The teeth were small and fairly unimpressive. There were many teeth and they acted like scissors. 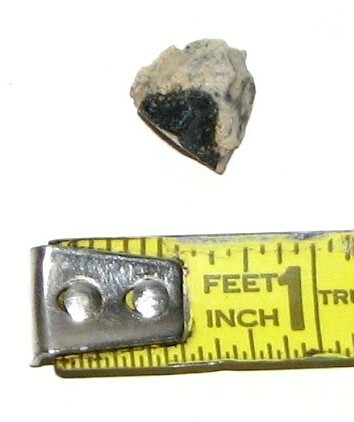 The photo on the right is a top view of a tooth. 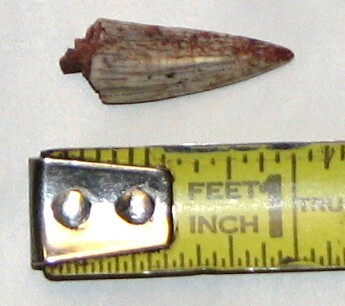 The flat surface would have acted with a similar lower tooth to cut the vegetation. They would have slid past each other similar to the blades of a pair of scissors. The triceratops was one of the last dinosaurs. Another of the last dinosaurs is the most famous. The Tyrannosaurus rex was not the largest carnivore nor the fastest, but he had the strongest bite of any carnivore. Much stronger than today's crocodile and stronger than any other dinosaur. About half this tooth would have been anchored in the jaw. The teeth were round and serrated. 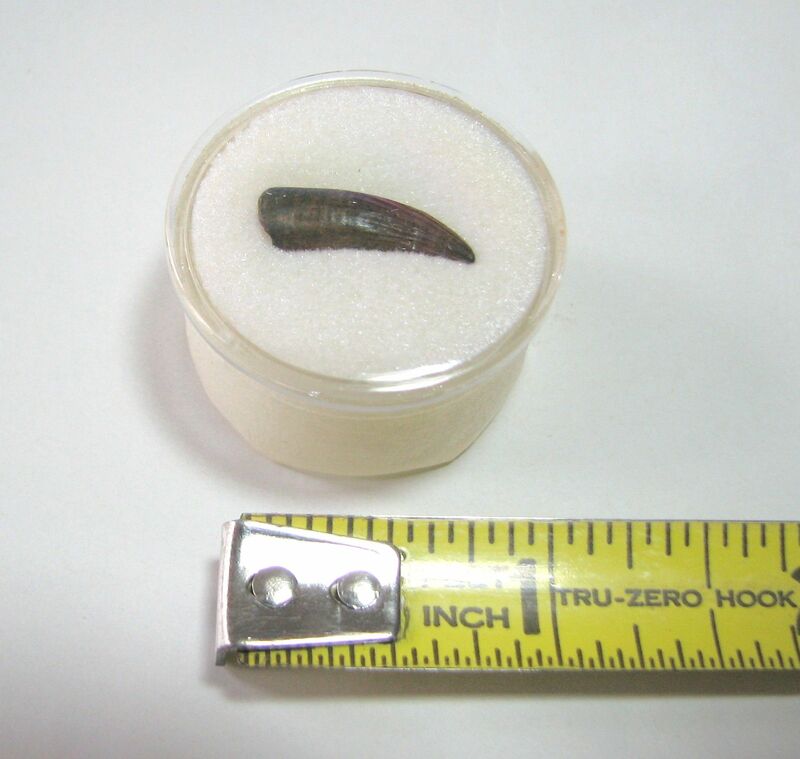 Below, on the left is an end view of a real Tyrannosaurus tooth. 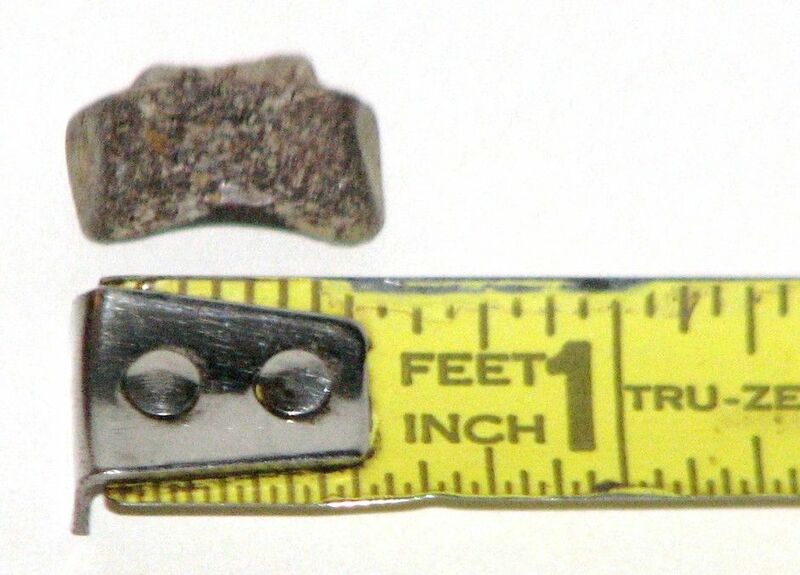 On the right is a close-up of the serrations (bottom edge). The round cross-section gave it strength, the serrations allowed the tooth to slice into flesh or, along with the strength, bone. A lot is said about the arms of Tyrannosaurus. His arms were actually the size of an adult human's arm, however, on an animal the size of Tyrannosaurus (he was about 40 feet long) they appear very small. 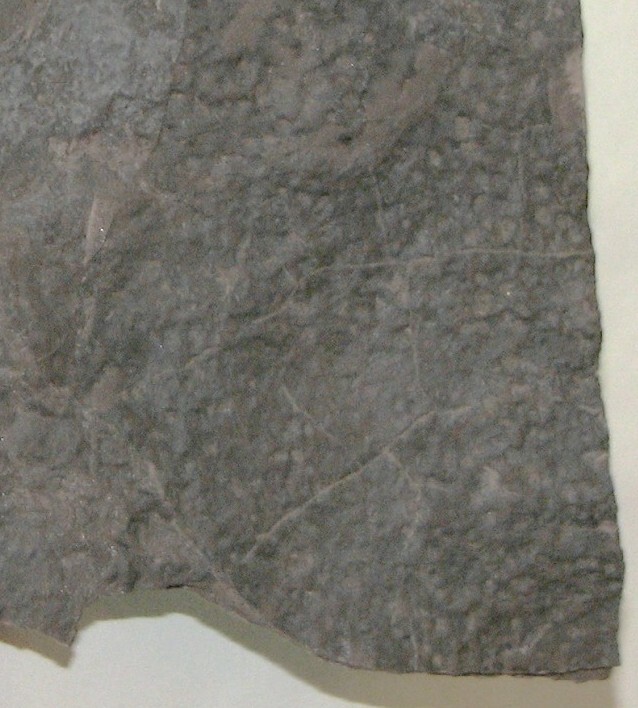 The end of the Mesozoic era came to an end with the crash of a huge meteorite. 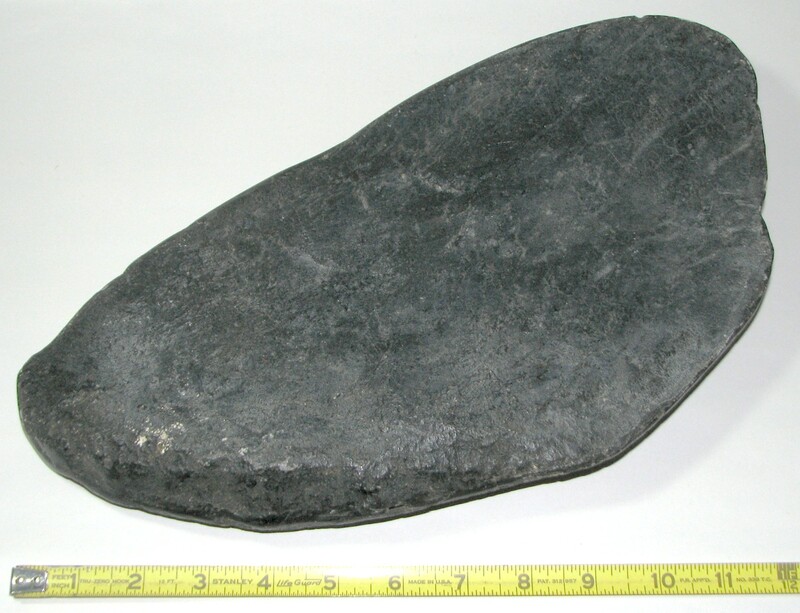 To give you an idea of the size, when the meteorite first touched the surface of the Earth, the other end was up where commercial airplanes fly. The huge-meteorite theory has been supported by the amount of iridium found at this time and by the discovery of a massive crater on the Chicxulub peninsula in Mexico. It also appears that the dinosaurs were dying off by this time. There were fewer species at the end of the Cretaceous than in the middle. Also at this time there were volcanic eruptions. Whatever the cause or combination of causes, at the Cretaceous-Tertiary border (K-T boundary) dinosaurs ceased to exist. More exhibits will be coming to this page in the near future - keep watching!